The city has public and private schools as well as numerous day cares and a Child Development Centre. The Child Development Centre has a newly built Autism Centre. There are twenty-six different schools ranging from twenty-three public school and three private school. School District #27 has nineteen elementary school, two high schools and two alternate school . 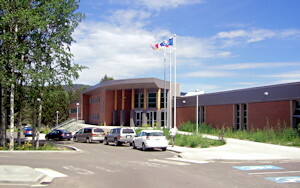 The school district contains rural communities and supports them with junior secondary schools that enables students to stay in their communities longer. There are special programs in School district # 27: Nature Kindergarten, lntergenerational program , grade 7 outdoor education, hockey skills Academy, French immersion, ACE IT industry training for high school kids, Heavy Metal Rocks, RCMP Academy, Secondary School Apprenticeship. Please contact them at www.sd#27.bc.ca. Private schools include a Catholic school (Sacred Heart) and a Seventh Day Adventist Academy. There are also numerous private day cares, preschools, and a business offering employment readiness training (ESP Consulting Ltd).